The Model 1.2m 1210FD FlyAway or DriveAway Premium Global SNG antenna provides video, voice, IP and data communication in a lightweight, easily transportable case-based solution. The antenna features a Ku-Band Precision feed (standard cross-pol comp.). 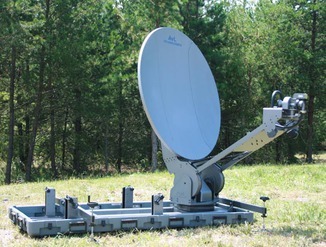 AvL's FlyAway or DriveAway (also called Fly&Drive) SNG Antenna systems provide versatility for satellite communication users who desire a vehicle-mounted antenna with all the portability of a flyaway mechanism in one antenna system. These systems are packaged into containers that meet air freight requirements allowing the system to be transported anywhere you can fly or drive.